Step 1: Specify the user name and password for JEUS Application Server in the JEUS configuration file (%JEUS_HOME%\bin\jeus.properties.cmd). The user name and password for JEUS is created during the JEUS installation. Step 2: Open the Windows Start menu and select: Programs | Appeon PowerServer 2019 | PowerServer for JEUS | Start JEUS. For Windows 7/2008/8/8.1 with UAC turned on, if you are running on a non-Administrator Windows account (such as an Administrators group member or a User group member), please right click the Start JEUS shortcut menu and then select Run as administrator to start JEUS Application Server/PowerServer. 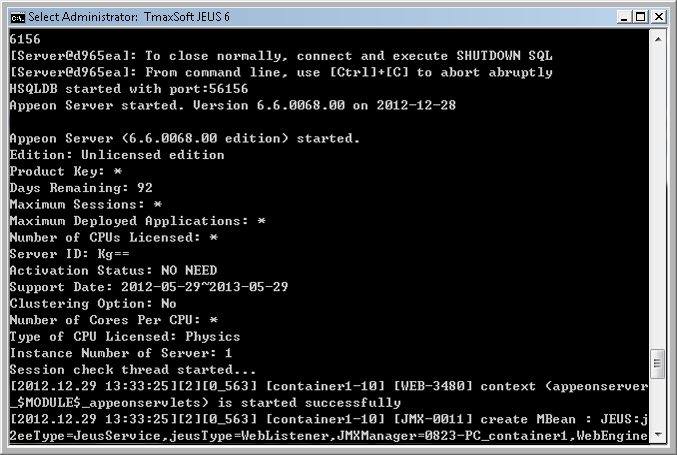 It will take several minutes to start JEUS and deploy PowerServer EAR package (if not deployed). When the server startup process is completed, the following message will appear in the command window.